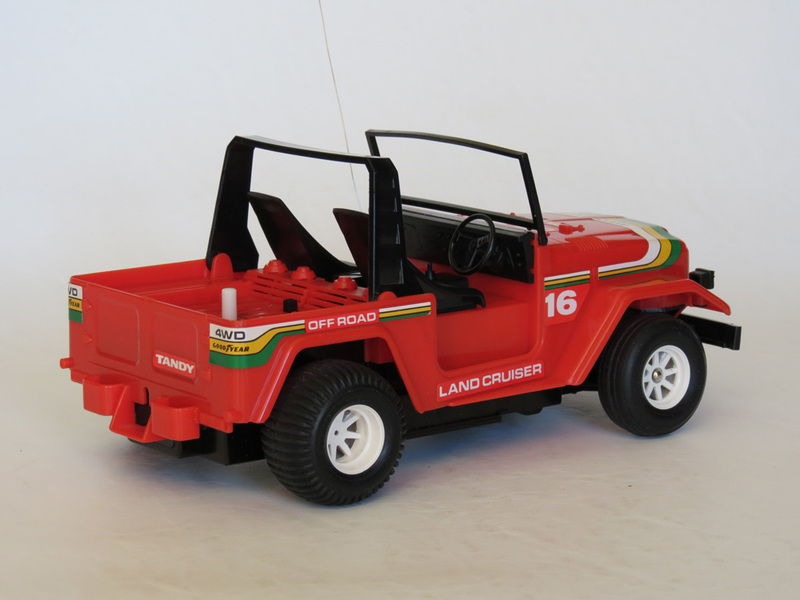 A cute and reasonably affordable little soft-roader from the era before the toy-grade manufacturers were making open-wheeled R/C buggies. It was available from 1983 – 1986. 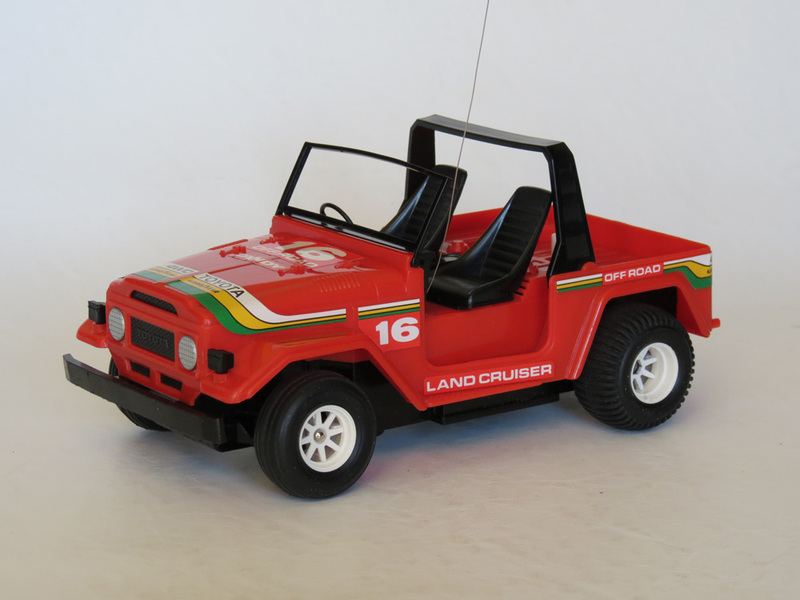 The Tandy Mini Land Cruiser is another of those little R/C toys that, just by looking at it, you can tell hails from another age. Can you imagine seeing anything like this in a toy store today? First sold at Tandy and Radio Shack stores back in 1983 (although I believe it’s first year of manufacture was 1981), they sold a green version at first, followed in 1984 by the red version seen on this page. 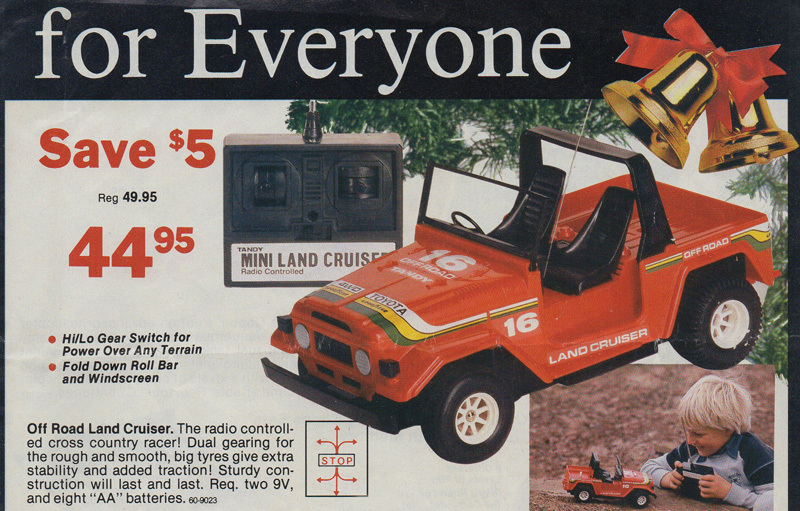 The red one is what I remember best, and I almost received it as a Christmas present myself back in 1984 (before my parents went with the larger Jeep Renegade instead). I always knew I would hunt one down though, and I found this one in near new condition. It originally belonged to a little girl who seems to have taken great care with it. 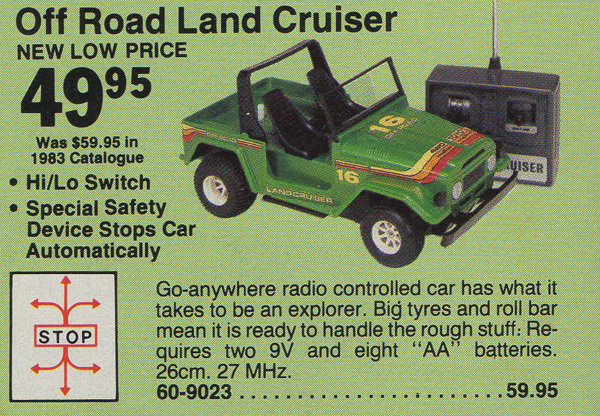 As you can see, the price started out at AU$59.95, and dropped to as low as AU$44.95 during sales, which despite the fact that this equates to well over $100 in today’s money, made it one of the cheapest full-function R/C cars you could possibly buy back then. The fact it was also capable of light off-road driving, made it even better value for it’s time. 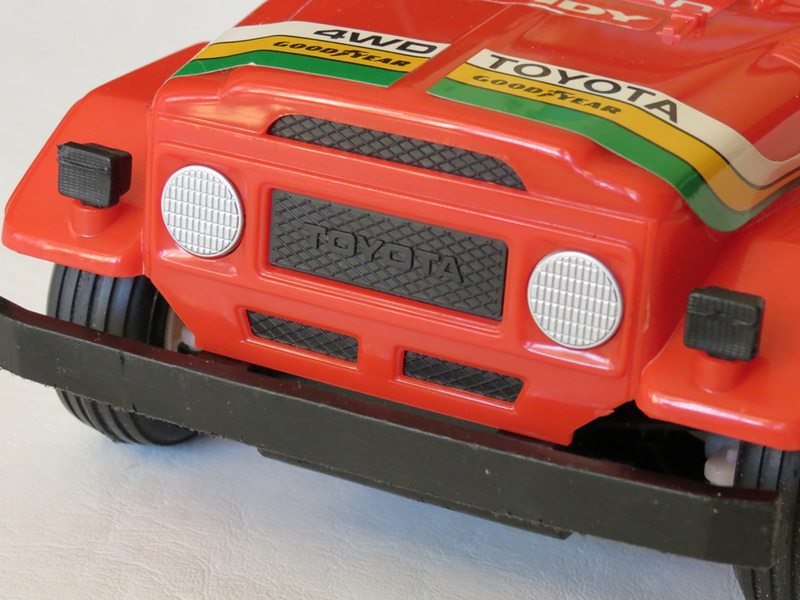 The trade off was that it was a little small – 1/16th scale, or about 26cm in length, which is a little smaller than most other off-road capable RC toys. And another downside is that, much like other early models like the Dune Buggy, the drivetrain is only one-wheel-drive – only one rear wheel is powered, with the other left to spin freely. 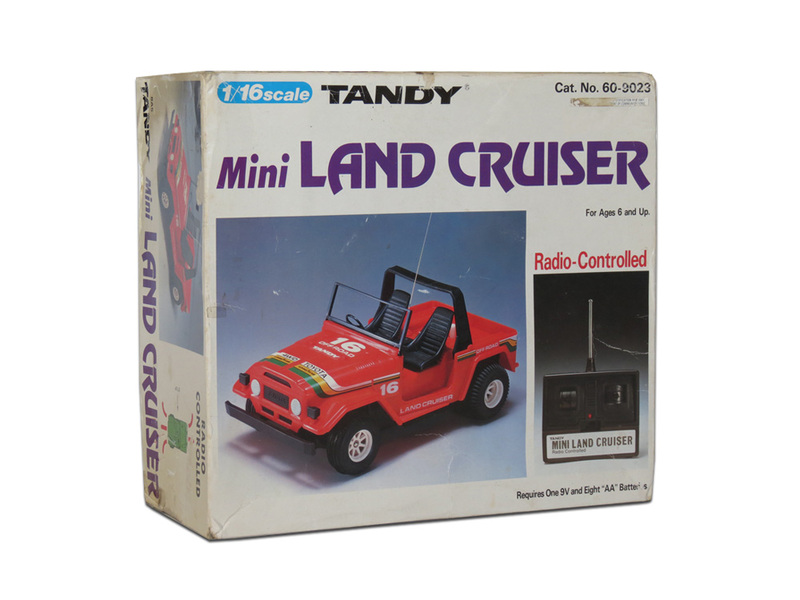 The Mini Land Cruiser was manufactured by Nikko for Tandy. And I’m not entirely sure what Nikko were thinking with the design of this model. It’s meant to be a Toyota Land Cruiser – it’s obviously called “Land Cruiser”, and you can clearly see the shape of an old 40 series Toyota Land Cruiser in the front grill. The “Toyota” badge is there too. But on the other hand, it has a low wheelbase and no roof – just a rollbar. It looks a lot like a toy version of a Mini Moke. Or perhaps a cross between a Mini Moke and a Toyota Land Cruiser. So I guess the name “Mini Land Cruiser” is actually quite appropriate. Instead what I mean is – it looks real in the sense that it could exist in full size. The front windshield has no glass in it, but both the windshield and the roll bar can actually be folded down. 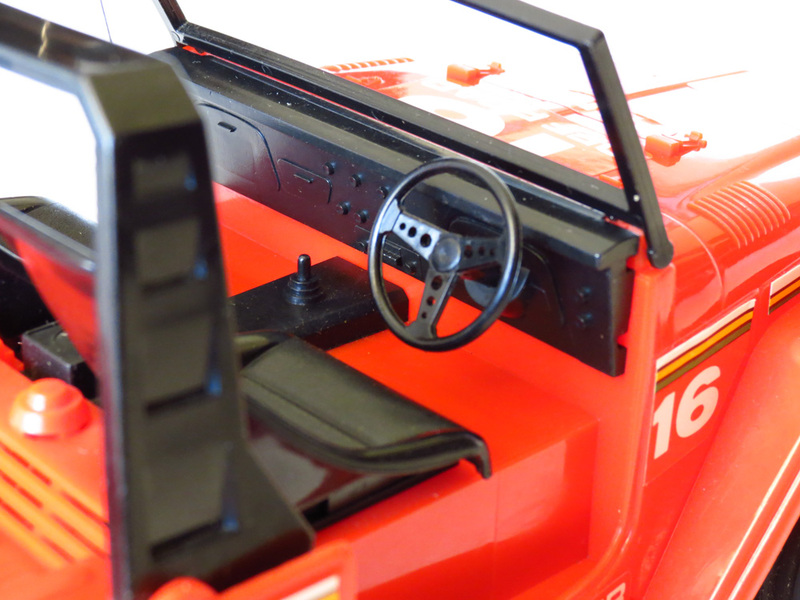 It would be fairly unusual for Nikko to not include a shiftable gearbox, and sure enough even though this was quite an affordable toy for it’s time, it still has a low/high gearshift lever in the rear tray. 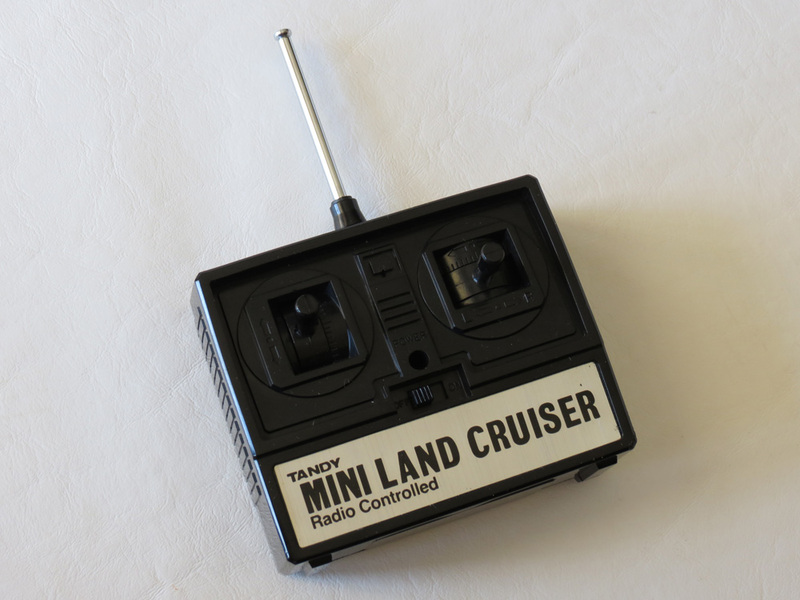 The performance of the Mini Land Cruiser is quite nimble for it’s size too, and the use of quite a lot batteries (you might expect it to take 6 x AA batteries, but it actually packs 8 x AAs) give it enough power for some entertaining scale speed in high gear and even some versatile torque in low gear. Of course being a 1WD, off road ability is going to be basic. But it’s fun to see that it has paddle-style rear tyres for paddling through sand. All the tyres are soft, but hard-wearing rubber, and are branded “Bridgestone”. The radio control is a simple and direct full function unit. 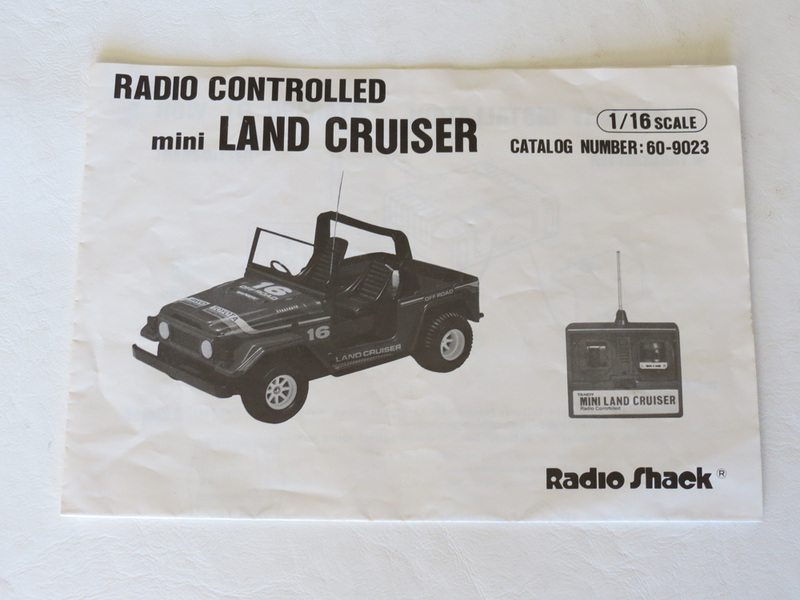 The Tandy/Radio Shack Mini Land Cruiser was really a very cute little R/C car, that with it’s open seating and roll bar. It just sort of begs to be played with, either with Barbie or GI Joe at the wheel – which meant it was fun for all children. I’m sure there must be a few people out there who still remember this one. 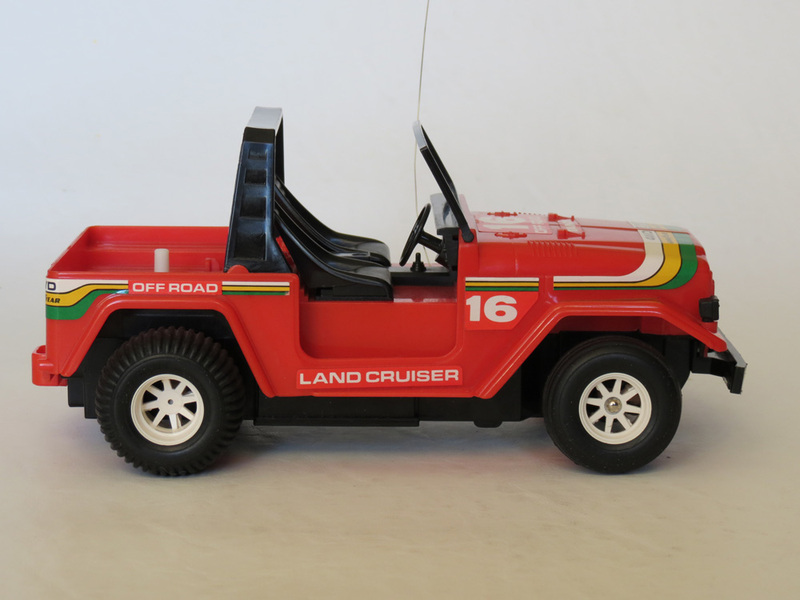 I should also mention that Nikko released an almost identical, much larger version of this “Land Cruiser” in 1/10 scale. So if you think you’ve seen this car before, only bigger and Digital Proportional, that was probably it. Perhaps I’ll profile that one another time. HI, GREAT PIECE, I HAVE TWO OF THESE IN THE ORIGINAL BOX, MANUAL ETC IF ANYONE IS INTERESTED IN BUYING? CHEERS GRANT. Hi Grant. I’m interested buying this jewel. This was also sold in a Dune Buggy variant, which I haven’t found on here yet. It has the same chassis as the Mini Land Cruiser, but with the styling of the larger Dune Buggy. Guessing it’s called the Mini Dune Buggy haha, mine is yellow and still in it’s box! 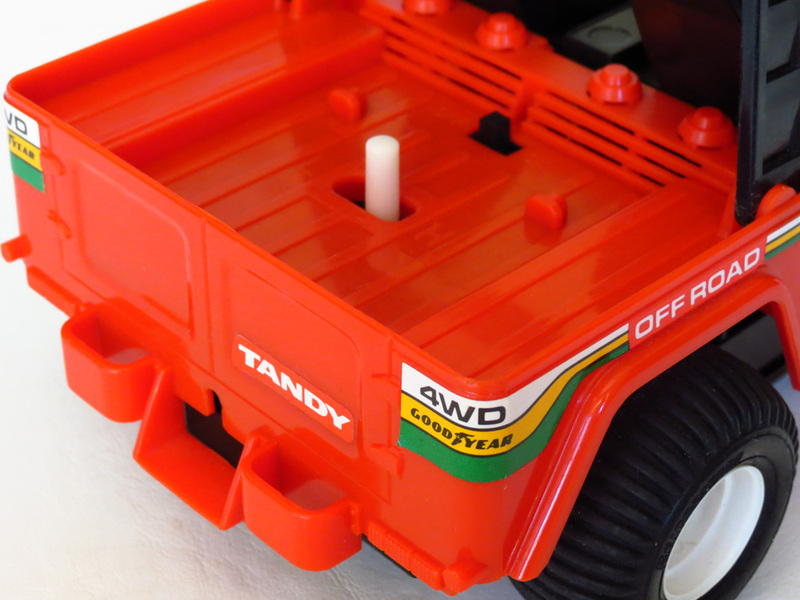 Self Correction – my little dune buggy doesn’t have any selectable gears, and only took 6 AA batteries, so must be a bit different. Box and art are very similar though. Weirdest thing about my version is there is no STOP control!!! The throttle stick is sprung to the forwards position, as soon as the car is turned on it goes. Dave, I think your little buggy was most likely called the Mini Thunder. It was made by Nikko, and they originally sold it in Japan as the “Mini Thunder Bicky” (go figure), while elsewhere in the world it was just “Mini Thunder”. It was never sold at Tandy/Radio Shack stores. I just got a green one and it definitely seems to be 2wd, turning either wheel makes the motor and gears turn and the 2 rear wheels will not move independently. Maybe they revised it? Im sure it’s the green one in your article. 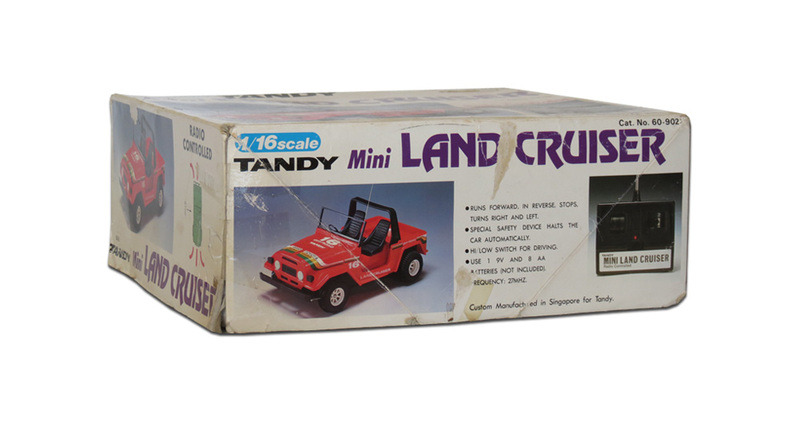 TANDY 1/16 scale mini land cruiser 2 speed 8 AA batteries. Will report back when I have it running. False alarm! There was a load of hair and fluff effectively binding the other wheel onto the axle lol. Back to 2wd now! Got another issue now, when I first turned it on it was very glitchy, jerking and moving by itself, responding erraticallly to input if at all etc. I opened it up and adjusted what I think was a potentiometer until it seemed to work better and now it’s pretty much drivable but still a little glitchy. But then it occurred to me that maybe it just needed a little time to warm up and I just thought I had made it better, now I can’t make my mind up and I’m worried I shouldn’t have adjusted anything. Also there’s probably a similar component in the TX so maybe that was the issue? It’s much better now than when I tured it on but still a little glitchy. Got two of those marvellous toys : A green right hand drive and a Orange Left Hand drive. Both are 1 wheel drive in high gear and 2 wheels drive in low gear. Ahh maybe that’s what it is because I was sure the wheels were both powered at first but then later only one seemed connected. Makes sense, I be that hi/low selector disengages the other wheel when you flip it. Still not sure if I did the right thing adjusting that component, I don’t even really know what it adjusts and i don’t know if adjusting it made the car better or it got better by itself after warming up. It might have not been used for decades. It works quite well not but stutters still occasionally and also decides to go in reverse when you press forward so it’s not quite perfect. I usually upgrade toy stuff to hobby grade but I’d quite like to keep this one stock If I can so hopefully I can work it out.